Amidst a spate of violent uprisings and protests in the Durban area recently, xenophobic attacks added to the pandemonium when a group of about 50 foreign nationals including women clutching their babies and children ran for their lives when they were attacked in their homes at the Burnwood informal settlement in the early hours of Tuesday morning. Finding refuge at the Sydenham police station, the group of stunned and panicked foreigners dashed out of their homes at about 2am in the morning fleeing with their loved ones and the clothes on their backs. By Tuesday night, the number of refugees had escalated to 150 individuals seeking shelter at the local police station. Speaking to The Springfield Weekly Gazette, Sydenham Community Police Forum communications officer and head of the Gandhi Development Trust Outreach programme, Satish Dhupelia, said the community immediately mobilised to address the volatile situation upon hearing about it. “I received a call from Domenic King of the Combined Community Watch in the area stating that a group of protesting locals had driven the foreigners out of the homes in the early hours of Tuesday morning. We rushed to the police station where we received permission from the station commander at Sydenham SAPS to accommodate the foreigners at the station. Thereafter, arrangements were made to provide the displaced individuals including, women, children and babies, with food and clothing,” said Dhupelia. “The foreigners are shocked that the locals have turned against them. Many of these foreigners have integrated themselves in the area with the locals as they have been living in the vicinity for between five to 10 years. They have partners, children, businesses, homes and jobs. Suddenly they have been uprooted and pushed out with nowhere to go. Some locals have intimated that they feel that the foreigners have taken their jobs whilst they struggle to find employment and hence, have reacted accordingly,” Dhupelia added. Dhupelia said there were some casualties among the foreigners when they were thrown out of the homes and they were provided with medical care. “The city’s Disaster Management team has been alerted to the situation and an area has been identified to temporarily house the foreigners until the situation has been resolved which is hopefully in a few days. The political leaders in power are implored to now look for a solution to this problem and re-integrate the foreigners into the community as was done during a previous situation,” said Dhupelia. On Tuesday night, about 120 Malawian nationals sought refuge at the Hilaal Mosque in Overport. Also victims of xenophobic attacks, they fled the informal settlement that they were living in as their lives were threatened. Through the compassion and care of locals, they were housed and fed until further arrangements are made for them. 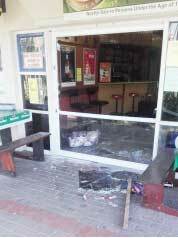 Meanwhile, in the wake of the violence that has erupted, eThekwini Mayor Zandile Gumede condemns in the strongest possible terms the attack of foreign nationals characterised by raiding of their shops at Burnwoood Informal Settlements. This follows reports that a shop owner of Pakistan origin is alleged to have shot at two locals who are alleged to have raided his shop. The two people are reported to have sustained severe injuries and were rushed to hospital where they are in a stable condition. The municipality has deployed members of Metro Police to control and monitor the situation in and around Burnwood and Kenville Settlements. Some of the displaced foreign nationals are currently at the Sydenham police station, while the authorities are deliberating on the next move with regard to their welfare until the situation returns to normal, said eThekwini Municipality’s acting head of communication, Mandla Nsele. The widespread violence incited by protestors and locals also claimed one life on Sunday night. In a separate incident, truck drivers in the vicinity of the Durban port were faced with a blockade caused by protestors who cited poor working conditions and slammed local truck companies for employing foreign nationals.